Ash reaches Valencia Island and receives the GS Ball from Professor Ivy. Brock leaves the group to stay and help Professor Ivy. Ash meets a Lapras who is seperated from its group and catches it. Ash beats Sissy and earns a Coral Eye Badge. Misty's Togepi starts to use Metronome. Ash beats Danny and earns a Sea Ruby Badge. Lawrence III starts catching the Legendary Birds in order to lure Lugia, until Ash restores order (Movie). Ash beats Rudy and earns a Spike Shell Badge. Ash's Charizard starts to obey him. Ash beats Luana and earns a Jade Star Badge. Ash defeats Drake and wins the Orange League. 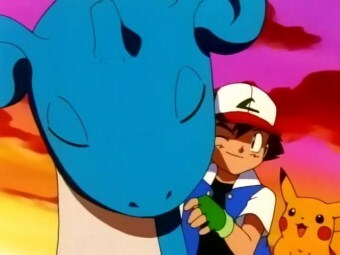 The group find a party of Lapras and Ash releases his Lapras. 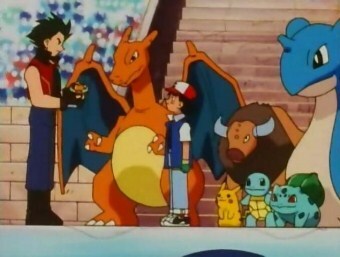 Ash gives the GS Ball to Professor Oak. Professor Oak gives the GS Ball back to Ash and asks him to take it to Azalea Town in Johto. Professor Oak gives Ash a new Pokédex. Tracey leaves the group to stay and help Professor Oak. Ash sets off for Johto. GreatWolf on Sun 16 Oct 2011 17:18:38 UTC. glash101 on Tue 29 Jan 2013 20:36:31 UTC.